Do you have sleep apnea but can’t handle a CPAP? We may have the treatment that’s right for you, and it’s probably covered by your medical insurance. It’s called Oral Appliance Therapy, and it’s changing lives for the better. Oral appliance therapy (OAT) is an effective treatment option for patients with mild to moderate obstructive sleep apnea (OSA). 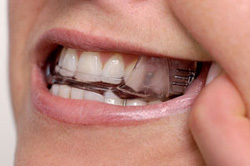 An oral appliance is a small plastic device that fits in the mouth like a sports mouth guard or orthodontic retainer. Oral appliances help prevent the collapse of the tongue and soft tissues in the back of the throat, keeping the airway open during sleep and promoting adequate air intake. Want to schedule a free consultation? Just fill out this form!